Our school field trips offer endless opportunities for problem solving, exploration and hands on science. Our field trip programs for students in preschool through 8th grade take advantage of seasonal events on the farm and in the forest to provide hands-on learning experiences that support curricular goals. Registration is open for the 2018-2019 school year and spaces fill quickly. Thanks to generous grants from The Denali Foundation and Columbia Belay, we can offer HIKING FIELD TRIPS for just $3/student for all New Haven Schools! Come join us for a farm tour and witness the exciting changes that happen each season. Students can meet the goats and sheep, spend time in the chicken yard and try different foods from the garden. 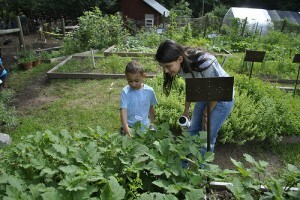 In the fall, we are harvesting the garden and preparing for winter. Springtime brings seedlings and the addition of new chicks and life on the farm. Classes are encouraged to visit both in the fall and the spring in order to fully appreciate the seasonal changes on the farm. Students will explore the role of soil in sustaining life on earth and learn about different soil types through investigation. Students will also learn about decomposition through an investigation of our compost pile and worm bin. We will discuss composting with red worms, check the temperature of the compost pile and learn how to start composting at home or at school. Students will trace the path of pizza from the local farm to our dinner table and the important role of sun, soil, water and air in everything that we eat. Each student will make an individual pizza from scratch and top it with fresh veggies and herbs from the garden. Fall is harvest time and students will also participate in harvesting vegetables, taste testing seasonal foods and visiting the animal yards. In winter, we can visit our greenhouses to harvest some cold weather crops like spinach and other greens! Students will learn about the journey from egg to chick to chicken through observation, demonstration and hands-on investigation. 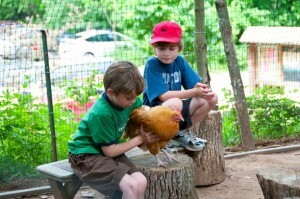 They will spend time observing and interacting with the chickens in the yard, see where the hens lay their eggs, meet a baby chick, and examine the parts of an egg. New England forests are rich with natural resources, the sweetest of which is maple syrup! Students will identify a maple tree, collect and measure sap, investigate the tools we use to tap trees, and learn how we boil the sap down into thick sweet syrup. Students will also learn the history of sugaring in New England, the biology of maple trees and taste test different kinds of syrup. Students will participate in activities that demonstrate the sheep to sweater process. They will meet the sheep, compare the textures of several varieties of wool, learn the history and process of shearing sheep and experience wool spinning. Each student will comb and finger-spin wool and create yarn to take home. Students will enjoy a hike or farm tour, followed by an introduction to Common Ground High School. Common Ground is a great option for students who are excited about science and environmental studies and are seeking a hands-on, college-preparatory high school experience. Common Ground is a free, public school and admission is by lottery. Students from any town in CT can apply (New Haven residency not required). Enjoy the cooler air of fall and winter as we take a short hike through the woods, ending at our campfire circle. Students will learn about tinder and kindling as we gather materials to make a fire together, followed by wrapping dough around sticks to make roasted bannock bread to eat! This warm and social program is a wonderful opportunity to celebrate as a class and to build group spirit and teamwork among your students. The forest serves as an ever changing outdoor classroom just waiting to be explored. Students will use their senses as tools to discover the plant and animal inhabitants of West Rock during our changing seasons. This is a short forest hike, appropriate for our youngest learners! Hikes offer a unique opportunity for students to interact with each other in a dynamic setting. While learning about the interconnectedness of the ecosystems of West Rock, students will participate in team building games and challenges that mimic these naturally connected systems. This is a great option as a class reward, or a way to build group cohesion and cooperation. The diversity of wildlife and unique habitats found in West Rock Park offer many opportunities for urban ecological study. 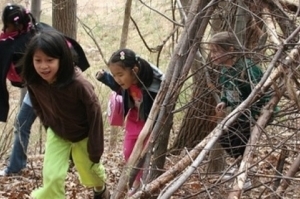 Students will hike through a variety of wildlife habitats including forest, meadow and aquatic habitats while learning about native species and how their needs are met in an urban forest. The specific trail we take can be tailored to meet the needs of your students, from mostly flat and great for inexperienced hikers to bigger challenges for energetic groups! Hike to the summit of West Rock! Along the trail, students will examine the terrain for evidence of water and make stops along the way to explore the forest and discover the story of how water has affected the landscape over time. Once at the top, the group will enjoy the view of Longs Island Sound and wrap up with a group discussion and activity on the Long Island Sound Watershed. This is a physically challenging hike that is lots of fun for an energetic group! We’d love to hear from you! If you’ve visited us for a school field trip, please complete our evaluation and enter your name into a lottery for the opportunity to win one free trip for your class. For more information, please contact Tara at fieldtrips@commongroundct.org or (203)389-4333 x1282.